"If this fight didn't come, then I think it would have been the Brook fight"
Amir Khan says Terence Crawford is the star name welterweight he was searching for in America, but a British battle with Kell Brook can still happen. Britain's former world champion has decided to challenge Crawford for the WBO title on April 20, with a venue to be announced, instead of accepting an offer to fight long-term rival Brook. Khan had been frustrated in past attempts to face Floyd Mayweather and Manny Pacquiao, prompting him to step up to middleweight for a knockout loss to Saul 'Canelo' Alvarez, but can now face pound-for-pound great Crawford in his preferred division. "I was always chasing that big fight," said Khan, who has been reunited with trainer Virgil Hunter. "This in a way, is a fairer fight for me. "In my division he is probably one of the best pound-for-pound fighters out there. "We tried to make the biggest fights in boxing and obviously it didn't happen. Look this is the type of fighter I am, I want to be fighting, mixing with the best. I enjoy mixing with the best. Terence is up there with the best. When I got the phone call for this fight, I couldn't say no to it, because it's got a world title on the line, an unbeaten fighter. "When I got the phone call for this fight, I couldn't say no to it, because it's got a world title on the line, an unbeaten fighter. They had Kell Brook there as well, but for me, this is probably globally a bigger fight." 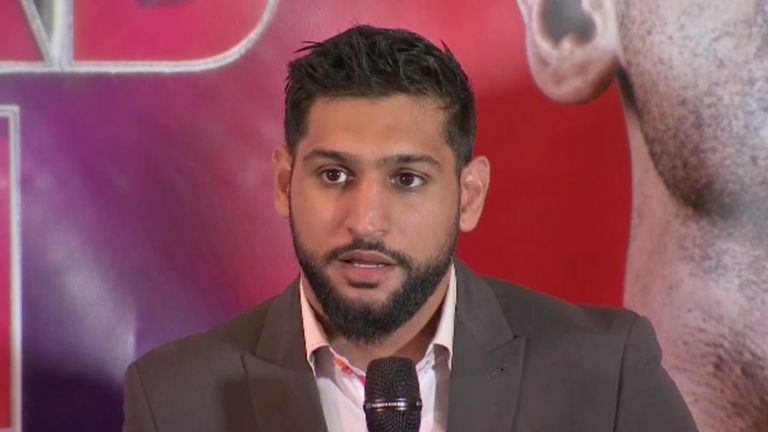 Brook had suggested that he would end his interest in Khan, if it was not his next fight, but the Bolton man believes a deal could be resurrected in the future. "If this fight didn't come, then I think it would have been the Brook fight," said Khan. "But I think the Brook fight is still going to be there, and it could be after this fight." Crawford is a three-weight world champion, with a 34-fight unbeaten record, but suggested that Khan could offer his sternest challenge. He said: "In his previous fights before his last two, you can arguably say this is Terence Crawford's toughest fight to date, but like I always say, you can never know until we fight the fight."